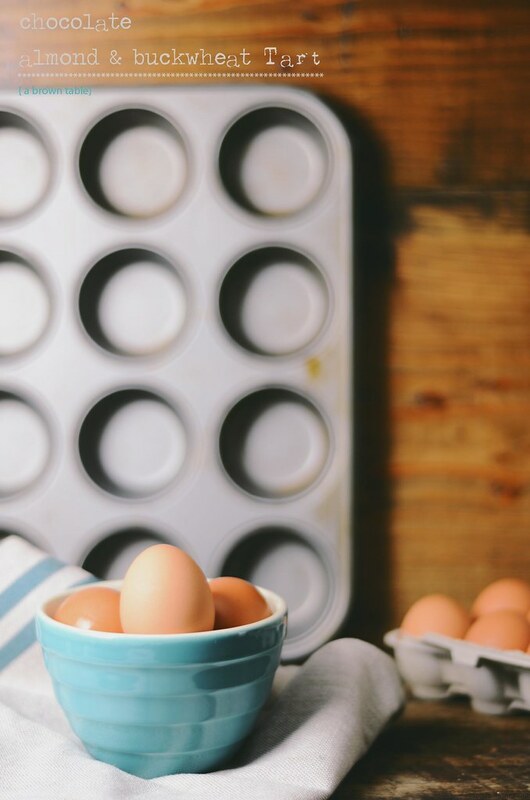 If there is one ingredient you'd love to bake with, what would it be? I have several but I think if given a choice, it would be chocolate and cocoa. In my books, I don't think anything can beat that warm sweet scent in the kitchen that I find so addictively comforting. Granted, I invariably end up making a mess every time I work with cocoa or chocolate, my white kitchen table ends up looking like a war zone with dark brown splattered streaks and spots all over the place. I mentally prepare myself going in armed with the knowledge that I will end up making a huge mess. In the end it never really matters. Because of that final moment, when nothing else matters and my eyes eagerly wait for that hot dark brown dessert to pop out of the oven. I'll admit I've burned my mouth a few times when I've been impatient enough to try and taste it hot. This is not recommended one bit, speaking from personal experience! Last weekend, I spent my time baking. I missed using my tart pan, I haven't used it in a long time and I felt it beckon me from the corner where it has stayed hidden for the past few months. A few minutes later, I had the pan in one hand and the other was busy shuffling through the pantry shelf, which is what we also refer to as my "Museum Collection and Assortment of Flours" (it's a whole shelf with several types of flours) which for some reason lacked any regular all-purpose flour. Thankfully, I still had a bit of buckwheat flour left to make my crust. I love buckwheat a lot for its characteristic nutty taste and gorgeous gray color. I made a very simple crust, buckwheat and ground almond meal with a little bit of butter to hold everything together. The resultant pastry reminded me of a graham cracker crust with a buttery and delicious nutty flavor. When it comes to preparing tarts and pies, I love my faithful trustworthy porcelain pie beads. But if you don't own any and can't find a store that sells them near you, use dried beans. I've had my beads for a few years now and they making blind baking a cinch. 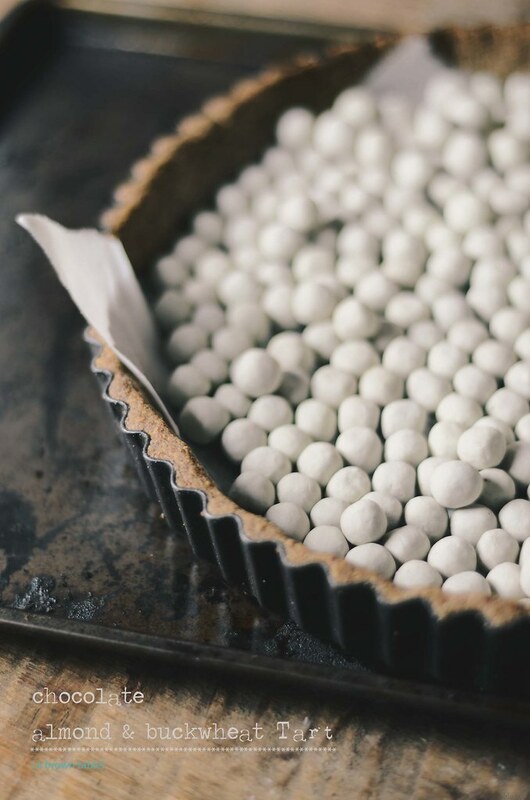 Adding the parchment sheet on top of the pastry surface helps to easily lift the beads off as soon as the tart comes out of the oven and there's a less chance of getting burned! Now for the fun part, the chocolate filling! Since it is autumn, I snuck in a little of bit cinnamon, not too much, just a little dab for a little bit of added warmth to the chocolate flavors. When this tart came out, it was every bit delicious, a thin fine crust outside with a moist gooey chocolatey inside. That against the buckwheat and almond crust made it simply enjoyable. And yes, I did my burn my mouth again while trying to taste this way too soon! 1. Preheat the oven to 325F. Line the bottom of a 9 inch ruffled tart pan with parchment paper and spray the sides lightly with a neutral oil. 2. 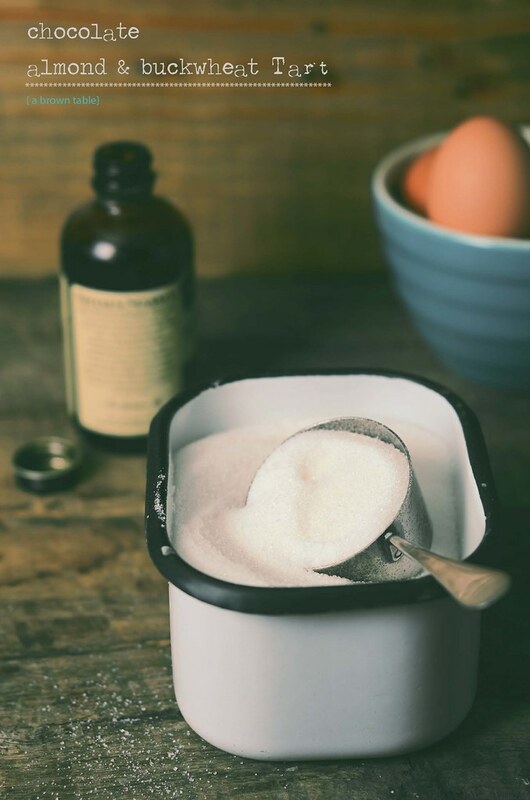 In a mixing bowl, whisk the dry ingredients to mix uniformly. Add the melted butter and mix with your hands to form a dough. If the mixture is too sticky allow it too cool a little, this will help it firm. Transfer the dough to the pan and with your fingers/ or using the bottom flat surface of a measuring cup press the dough up the bottom and sides of the pan to form a layer of even thickness. Cover the crust with clingfilm and refrigerate for 30 mins. 3. Remove the cling film and prick the surface of the crust a few times with the prongs of a fork. Cover the top surface of the pastry with parchment paper and place some pie beads or dried beans. This will prevent uneven rising during the baking process. Bake the pastry for 20 minutes in the center rack of the oven (this is also called blind baking). The edges will be slightly golden brown at this point. Carefully remove the pie beads along with the parchment sheet paper on the top surface. 4. 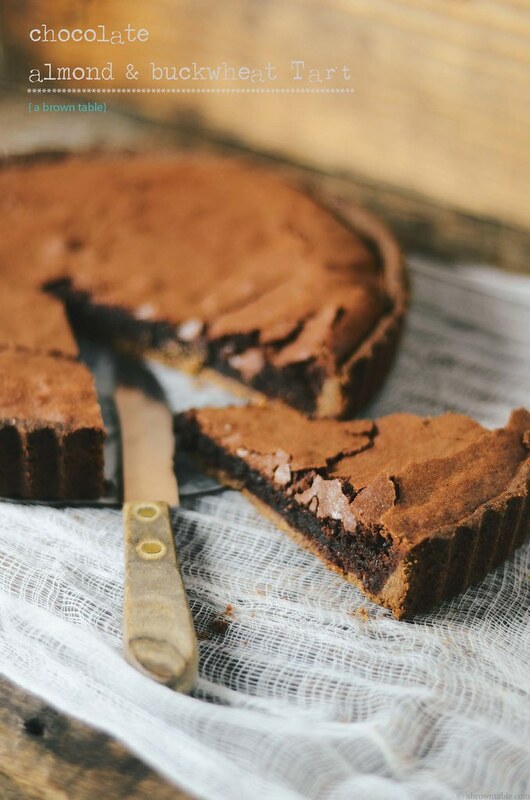 Pour the warm chocolate tart filling (recipe below) into the tart shell, even the surface with a flat offset spatula or a flat butter knife and bake the tart for another 15-20 minutes or until a skewer comes out clean from the center of the tart filling. Transfer the tart from the oven and allow to cool for 15-20 minutes in the pan on a wire rack before removing and transferring it to a clean serving plate. The tart will have a delicate crust on top but a moist gooey texture inside. Slice the tart with a sharp serrated bread knife and serve warm or cold. 1. Melt the chocolate, cream, and butter together in a thick bottomed saucepan over a boiling water bath. This should take about 2-3 minutes. Mix constantly till smooth to get a shiny silky smooth sauce. Keep warm. 2. In a large mixing bowl or stand mixer, whisk the eggs, sugar, and vanilla at high speed for 5 minutes until you get a pale yellow lemony color and a ribbon can be formed with the eggs, the eggs will have tripled in volume. 3. Fold the chocolate mix into the whisked eggs carefully with a circular motion. There will be some deflation but avoid losing too much of the trapped air. 4. Please refer to step 4 above, listed under the tart crust instructions to finish off the tart. In "Almond", "Baking", "Buckwheat", "Butter", "Chocolate", "Dessert", "Tart", "gluten-free", "pastry"
My grandparents had a house in Goa on the West Coast of India that was located in an historic part of the capital city, Panjim (now known as Panaji). Practically every summer, the entire family including my grandparents, would take a trip down where we'd spend a couple of weeks by the ocean and relax in the warm sunny weather. The house was old, large and at times dark, which scared me a little but there were so many fun moments. I remember every morning, waking up to the sound of the horns and then running out out on to the tall balcony to see if I could stretch up to see the incoming ships that stopped at the dock. I remember my mom showing and explaining to me some of the antique china and pieces of furniture (a big round white marble table with huge wooden legs, that I would love to own today) that had been collected over the years, of course at that time I displayed very little interest in these things (now it's a whole different level of fascination when it comes to antiques). There was a stack of paper, so old (I vaguely remember seeing a watermark imprint of the British Royal Family on it) and delicate that every time you tried to handle a sheet, it would crack and break (breaking rather than ripping paper was a strange and fascinating concept back thn to a kid back then). The things that were much more fun to a ten year old back then, were the steep staircase at the back, the deep well (that was off-limits) and the garden that were enclosed at the back of the house. I remember the coconut, jackfruit and mango trees that adorned the garden and every summer we would eagerly await our bounty. My grandfather would hire someone to come and pick the fruit out and we would sit and watch with eager anticipation. For me, it was mostly the mangoes, they were sweet and juicy and delicious. I have not been back in more than a decade. The house has long since been sold, demolished and the ground now stands home to a large condominium/shopping mall but some of the memories are still stored up here in my head. This summer, the new boat has brought back some of those early childhood memories by the ocean and along with it a strong craving for mangoes. 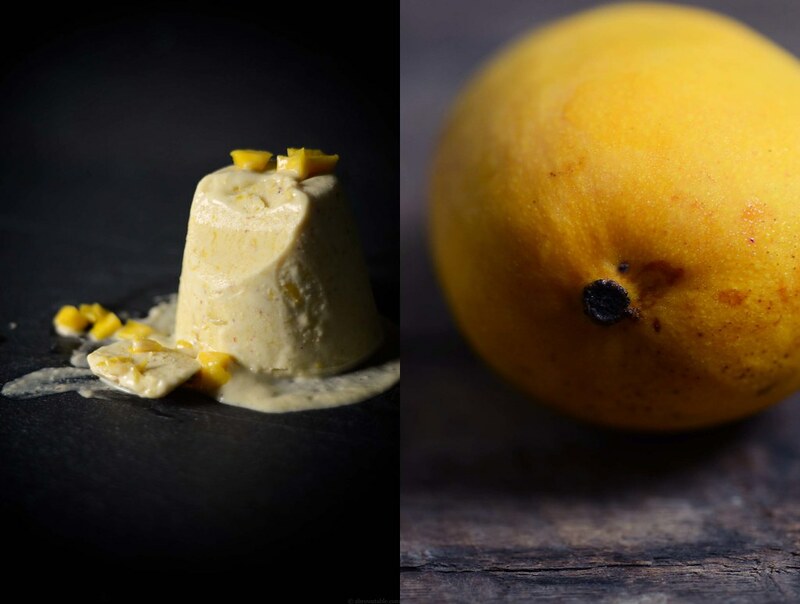 Last weekend, I decided to whip up some of the memories and freeze them in this kulfi recipe. 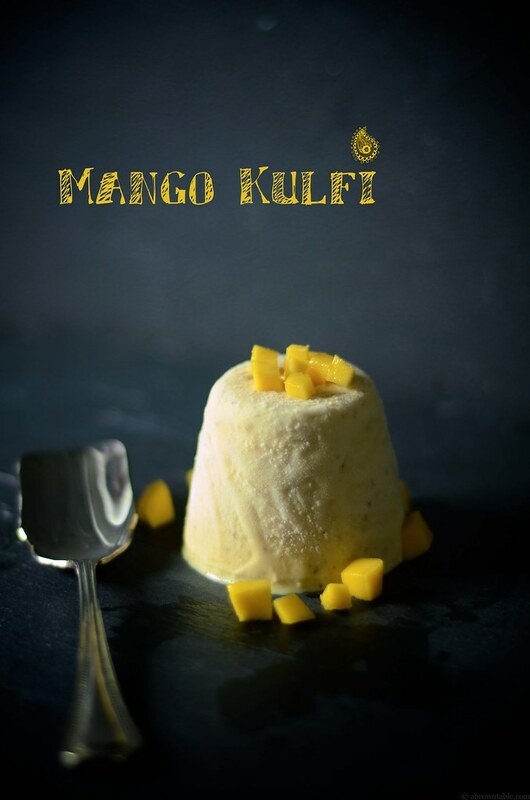 I hesitate on calling kulfi an Indian ice-cream (thought it is described sometimes as such) because it is very different, it traditionally uses less fat and lacks eggs or corn starch as thickening agent when compared to a typical ice-cream. It also has a unique texture of its own, it is creamy yet not soft but firm with a very mild grainy texture that comes from the ground almond meal. Yet it is so simple to prepare but still so complex in flavors and textures that it remains a very popular frozen dessert in Indian cuisine during the hot summer months. 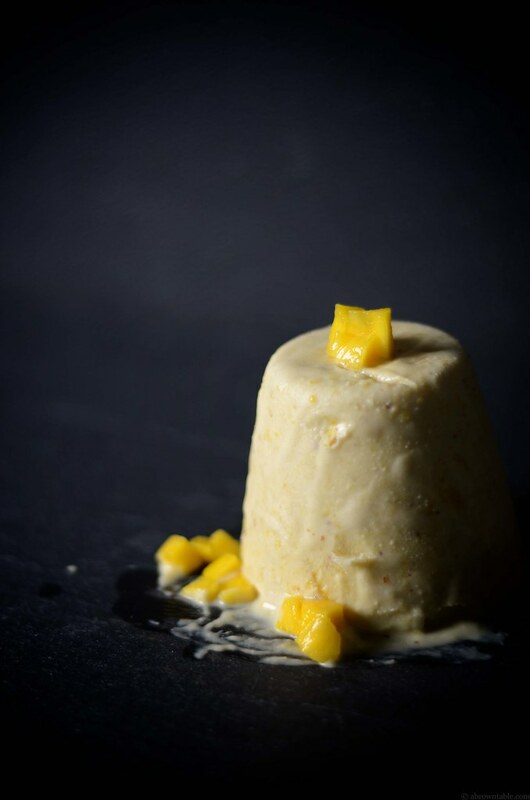 I used freezer-safe cappuccino cups to set the kulfi but you can use the traditional kulfi molds (which you can find online or at your local Indian food store) or small conical tea cups or even popsicles molds. 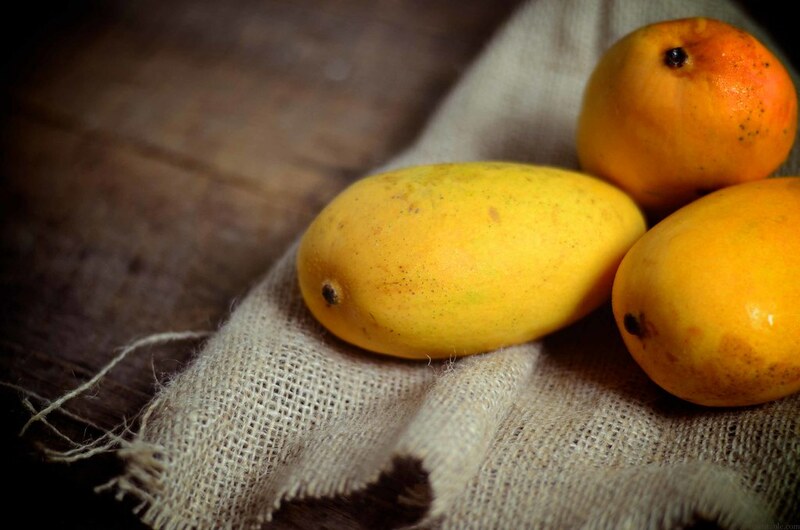 India has several different varieties of mangoes and they are sweeter and much more flavorful than any other mango that I have tasted from elsewhere. The Alphonso variety are one of the sweetest, there are others that are simply not eaten by scooping out the flesh but rather sucked out because their meat is sweet but their texture too stringy to chew on. If you every get the opportunity to visit the Indian west coast during summer, I highly recommend trying one of the many mango varieties of the local region. When buying mangoes, press them gently they should be soft but not mushy. They should also give off a sweet fruity smell and the skin should be as yellow as possible with absolutely (preferably) no traces of green color. 1. Bring the milk and sugar to a boil in a thick-bottomed saucepan, stir constantly with a silicone spatula to prevent the milk from scalding. Reduce the flame to a gentle simmer and add the honey. Continue to stir the milk and simmer for another 20-25 minutes until it reduces to approximately 3 cups. 2. Stir in the saffron and cardamom and once again bring the milk to a boil. Continue to stir and fold in the almond meal. Boil for 2-3 minutes and remove from the stove. 3. Fold in the cream and mango puree. Cool the mixture to room temperature. 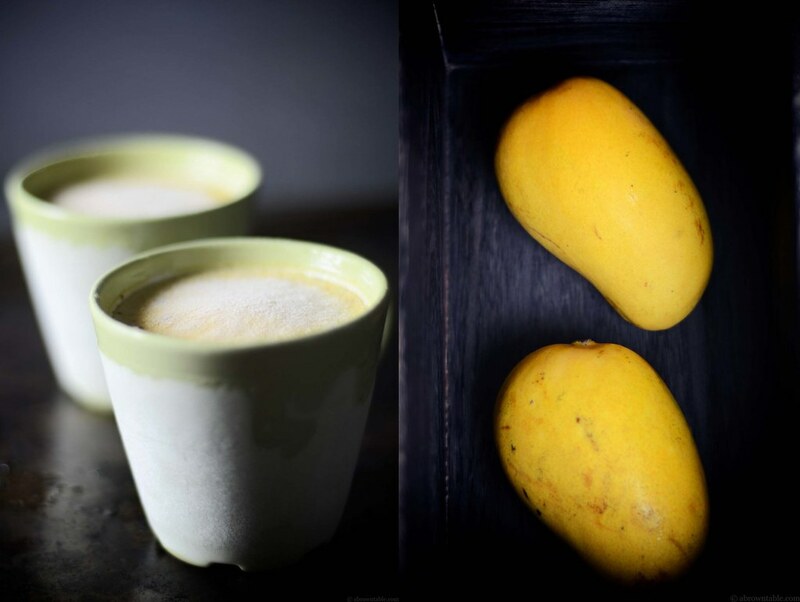 Pour into freezer-safe cappuccino cups (or kulfi molds). Cover the open end with cling film and freeze for at least 10-12 hours to firm. 4. Before serving, place the frozen mold into a warm water bath or running hot water from a faucet to release the kulfi from the mold. Stick a knife into the center of the kulfi (not all the way through, just deep enough to help you maneuver the kulfi) and rotate the kulfi to get it out of the mold. Garnish with freshly diced mango fruit pieces. In "Almond", "Cardamom", "Dairy", "Dessert", "Fruit", "Ice cream", "Indian", "Kulfi", "Mango", "Mangoes", "Milk", "Saffron", "cream", "frozen"
So many things to celebrate! Having my family here for the big commencement ceremony next Friday makes this achievement extra special and I am staying quite busy showing off the treasures of our Nation's capital. Last week we had the opportunity to visit several places, but one topped our list--Arlington National Cemetery. Having never visited this honorable and historic site, I was overwhelmed with the picturesque and breathtaking views. They also have a little museum that houses medals awarded to the U.S. from different countries which was a nice and interesting find. Navigating D.C. has become quite easy for my family and they've been doing their own exploration during the day while I am at work, often coming back with interesting facts that I have missed. Besides me, Snoopy is loving having guests since he receives non-stop attention, gets to sit out in the garden and appears to have won my mother over since she is convinced he is always hungry and needs to eat more. This is a funny story that I have to share with you. On the weekend while completing a couple of errands out in Virginia, we decided to grab lunch at a restaurant. Our order was not complicated, a couple of salads and drinks. For some reason, our order took forever so we asked the manager why everyone but us got their orders. The manager replied that it was taking some time but it would be there soon. Finally, we got our order and the assistant manager who brought our food out said "There's no cook". I was flabbergasted, it made no sense and is probably the most bizarre excuse I have heard in a while. Though we were annoyed, we were tired and hungry. We finished our lunch and got back on the road to finish the rest of our errands. Needless to say we will not be going back to that restaurant. I recently received a special request to bake a chocolate torte. Having never made one before, I was a bit apprehensive mainly because it is one of those desserts that requires a bit of patience and care during preparation. 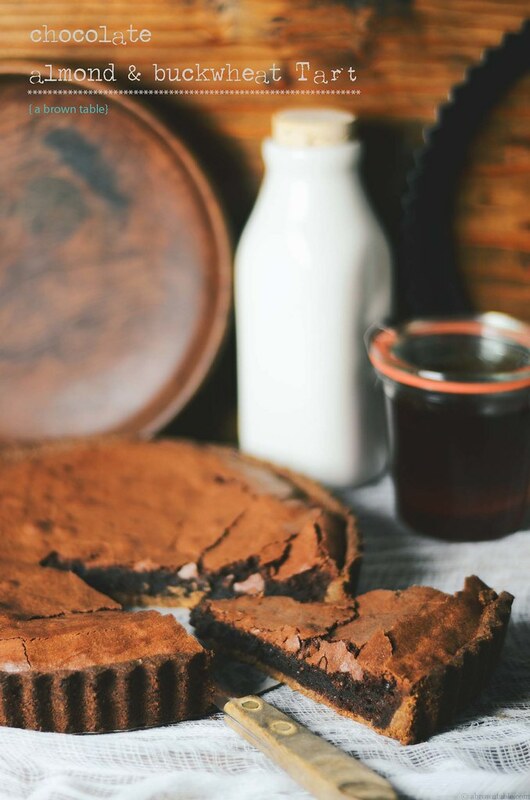 Since Alice Medrich is my go to for all things in the chocolate world, I was very lucky to find this recipe for her Italian Chocolate Almond Torte in her Pure Dessert cookbook. She has the knack of making the most complicated of desserts so simple and yet delicious. I added a chocolate drizzle to give the torte a richer texture and flavor. You can use blanched or unblanched almonds in this recipe. After having tasted a slice of this delicious torte, I have also come to the conclusion that it is way healthier than a rich chocolate cake since the yolks and flour are kicked out. So please do not feel guilty in indulging your cocoa needs and desires with this dessert. Preheat the oven to 350F. Grease a 9 inch circular springform pan and line the bottom with a sheet of baking paper. Keep aside. In a food processor, combine the almonds, salt, 1/2 of the sugar, and chocolate to get a coarse and crumbly mixture. In the bowl of a stand mixer, whisk the egg whites and cream of tartar at high speed to get soft white peaks. Add the rest of the sugar and continue to whisk at high speed for another 3 minutes. Gently fold in half of the almond cocoa mixture by moving from the outside to the inside, just like you would with genoise cake without destroying the structure of the foam that you made by whisking the egg whites. Fold in the rest of the almond cocoa mixture. Pour the batter into the greased pan prepared earlier and bake for about 20 minutes in the oven. The torte is done baking when the top gets golden brown and the center is firm to touch. Let the torte cool in the pan and then remove to a serving plate. Drizzle with the chocolate drizzle (below). To prepare the drizzle, melt the chocolate over a simmering water bath with the whipping cream. When completely melted and combined add the powdered sugar and keep mixing over the water bath. The mixture may form into a small ball. Add half of the hot water to the chocolate and keep mixing till incorporated. Add the rest of the water and combine till a smooth liquid is obtained. Remove the glaze from the water bath and allow to cool till it is lukewarm (rather does not feel too hot to your skin). Pour the glaze on the top of the torte. You can store any left over chocolate sauce and serve it on the side. In "Alice Medrich", "Almond", "Arlington National Cemetary", "Chocolate", "Cocoa", "Torte"
There is a constant staple of apps on my iPhone that I use daily. Besides checking my email and text messages, I constantly use my Pandora station. It is sometimes hard to imagine how I ever traveled without my constant musical companion. My dependence on technology these days appears to be getting all encompassing and I am not sure what I would do without constant internet access. I have no complaints though, I enjoying every minute of being connected. Its made me some wonderful friends along the ways especially through this blog. Its finally the end of the week and time for dessert. Mostly that's how I think weekends should be redefined, in terms of dessert. Almond milk is probably the best kind of milk substitute. It is naturally sweet and rich in proteins and healthy fats. Almond nuts by themselves are very popular in Indian desserts and even make a great garnish to some rice and meat dishes in Indian cuisine. This particular cake was inspired by the Latin American Tres Leche and a couple of ingredients common to Indian desserts - cardamom and almonds. Cakes can make everyone happy, even the biggest sourpuss on the planet (or so I'd like to think) and I've been wanting to make this for a while. I added a bit of ground cardamom and slivered almonds to the cake. While this cake bakes in your oven, the aromas will breathe a new flavor of freshness in your kitchen. There is nothing better than the scent of toasted almonds in a room. Unlike the tres leche which uses three different types of milk to soak the cake, this cake has the milk replaced by almond milk. A new marriage in heaven was created when I heated the almond milk with some freshly ground cardamom seeds. I admit to keeping a little of the lightly sweetened milk aside to "taste for personal reasons". There is no need for whipped cream when you have crunchy and toasted almonds on the cake's soft crust. Try this unique chilled almond milk cake and it will surely make you a very, very happy trooper! You might have notice in this particular post, I have "overused" the little silver cup in my photographs. I wanted to test and see how much I could stretch my imagination with this prop for a single post by keeping the cake the subject of each photograph and everything else secondary. 1. Preheat the oven to 350F. Gently grease and lightly dust a 9" X 13" baking pan with a little butter and flour. 2. Sift the flour, almond powder, and the baking powder twice and keep aside. In the mixing bowl of a stand mixer, cream the butter and the 1 cup of sugar together using the paddle attachment on medium-high speed. 2. Beat the eggs into the creamed mixture, one at a time till completely blended. Beat 4 tablespoons of the sifted ingredients to the creamed mixture each time, until all of the flour mixture is completely blended. 3. Fold in the almond powder, almond extract and half of the cardamom. Pour the cake batter into the prepared pan and gently spread the batter evenly with an offset spatula. Sprinkle the top of the cake with the slivered/sliced almond and bake for about 30 mins or till a knife comes out clean from the center. Remove the cake and let it cool to room temperature in the pan. 4. Heat the almond milk, rest of the cardamom and sugar till it comes to a gentle simmer on a low flame. Using a butter knife cut the cake in the pan into equal squares. Gently poke the surface of the cake with a fork to make holes for the almond milk to seep through. Pour the milk mixture on to the surface of the cake evenly and cover the pan with a lid and let the cake chill for at least 4 hours (8 hours is best) before serving. Serve chilled. Note: While sifting the almond flour, you may get a couple of tiny grains of ground almonds (depending on how fine you grind them) left back in the sieve, just toss them back into flour mixture. In "Almond", "Cake", "Cardamom", "Dessert"
This was a week packed with punches and kicks! It included my foray into the world of kickboxing, I've been in desperate need of a more spelled-out and defined workout schedule and I hope this new athletic venture of mine filling that gap. It feels more like winter than fall in Washington, the sudden drop in the 50s and the relentless rain is making me moody. What does get me through this kind of weather, is the smell of the warm oven while I bake and hot tea at any time of the day! The oven seemed to beckon, to make this cold and wet weekend enjoyable and warmer. Having recently purchased several autumn Bartlett pears, the urge to bake a pear flan with an almond and chocolate filling seemed hard to ignore this weekend. I modified a tart recipe from my copy of the The Essential Baking Cookbook. Halloween is officially around the corner and I still do not have a costume or even an inkling of what to wear. It keeps getting harder each year. This weekend is also the Taste of D.C. which will be an exciting and delicious walk through Penn. Ave. I had chopped almonds in the pantry but if you can find pre-ground almonds, that will work as good. This pear flan is best served chilled after at least 2 hours of baking. I used my food processor to save time on making the dough. I have also found that making pastry dough with frozen versus chilled butter produces a much lighter and flakier crust. Rolling out the pastry dough between cling wrap or parchment paper makes it easier to handle the dough, without having to flour the surface that could make the pastry dry. 1. Attach the dough blade to the food processor and pour in the flour and cubed butter. Pulse till the flour resembles a crumbly mixture. 2. Pulse in the sugar, followed by the addition of the egg yolks, one at a time. Remove the dough ball from the processor and wrap it in cling wrap and leave it to rest for about 30 minutes in the refrigerator. 3. Preheat the oven to 350F and lightly grease a fluted tart tin with a little butter. Cut a circle of baking/parchment paper equal to the size of the base of the tart tin and line the bottom of the tin with it. Remove the dough and roll it out between two sheets of parchment paper to form a 14 inch circle. Now, remove the top layer of the parchment paper from the rolled out dough and line the tin with the dough. Remove the other layer of parchment paper and using the rolling pin trim off any excess dough from the edges of the pan. Lightly proof the pastry surface with a fork to let any trapped air exit during the baking process. Cover the surface of the pastry in the tin with dry uncooked beans or pie weights. Bake the pastry shell for about 10 minutes. Remove the beads and then bake the pastry for an additional 5 minutes. Let the pastry shell cool for about 15 minutes in the refrigerator. 4. To prepare the filling, cream the butter and sugar by beating in a large mixing bowl. Beat in the eggs individually. Pour the melted chocolate and mix it in the filling mixture. Now fold in the ground almonds and flour. To the cooled pastry shell, gently pour in the pie filling in an even layer. Arrange the pear slices on the surface of the filling and bake the tart for about 30 minutes or till the center is firm. The pears will caramelize a little during the baking process. Allow the tart to cool to room temperature in the tin and then transfer it to the refrigerator to cool for another hour or till firm before it can be served. Using a sieve, dust the surface lightly with sweetened cocoa powder and icing sugar. In "Almond", "Chocolate", "Dessert", "Flan", "Pear"
It was terribly hard to try and get some time to post over the weekend mainly because I over booked myself. I did however have a wonderful time after finally getting to see and participate in the interactive murder mystery play "Shear Madness" at the Kennedy Center. Classes have finally begun and thesis stress is underway but I think I am finally getting close to picking a topic that is interesting. The onslaught from the rain is still pretty strong and the daily showers daily are reminiscent of the monsoon seasons of Bombay. There is nothing better than sitting in bed on a rainy weekend with a warm bowl of halva. I like halva of all sorts but one of my favorites is the simple semolina or durum halva with toasted nuts and sultanas. I gave this age old family recipe a bit of change by using sultanas that were soaked in dark rum for six months. I know six months is a long time for this but since I am one of those people that make a Christmas fruit cake every year and must have my dry fruit soaked in dark rum for at least year, I always have some on hand in my pantry. You can get away with sultanas soaked in dark rum for at least one night. The sultanas get plump with the rum and add a nice grown up feel to the dessert. If you don't want the rum skip it. You can substitute the sultanas with raisins. For the nuts, I used raw slivered almonds but walnuts would also be great in this dessert. This semolina halva is not only a fun dessert but also rich in fiber and nutrients and makes for an excellent dish at breakfast. 1. Heat a nonstick skillet on a high flame and toast the semolina. Stir the semolina constantly to ensure an even light golden brown color but taking care to avoid burning the semolina. Add the butter to the pan and mix it into the semolina. 2. Reduce the flame to a low-medium flame and add the sultanas and almonds. Stir the mixture for about 2-3 minutes till the sultanas and almonds get lightly seared. 3. Add the saffron, sugar and water along with the any liquid left behind from the sultanas. Cover with a lid and let it cook till all the water evaporates. Serve warm. In "Almond", "Dessert", "Indian", "Semolina", "Sultanas"